This 32 oz. 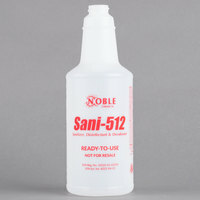 dispenser bottle is labeled for use specifically with Noble Chemical Sani-512 food surface sanitizer (sold separately). Buying bulk cleaning agents and spray bottles will save your business on cleaning costs. This pre-labeled dispensing bottle makes it easy to create and control ready-to-use dilutions of your cleaning chemicals, while remaining in compliance with OSHA chemical labeling regulations. Superior quality for a superior product! They have the instructions printed on them, but of course, you can always use a different sanitizer or other material. The bottle works well and fits the spray trigger. We appreciate that it is already labeled as it can be difficult to get labels to stay on bottles with chemicals sometimes. Perfect for what we needed. We wanted to be able to mix sanitizer to wipe down tables for different areas and this works great. Perfect size for holding enough but not being too heavy. Large sanitizer bottle labeled for convenience so employees won't mix up chemicals. Health department loves these bottles. and don't have to label them for the food safety inspection. This sprayer bottle has thick walls and a stiff plastic, and feels high quality. The printed label and fill markings make it easy to mix and use. Necessary supply for home or commercial kitchen. Thick plastic, should last many years. This is only the bottle, don't forget to order the spray trigger! We needed a spray bottle for our bleach water that didn't leak and this does the job. The bottle is easy to fill and easy to handle. Nice quality, large sized bottle. It fits perfectly with the 9" adjustable spray trigger, and the distinctive red text color let's me grab the bottle off the shelf "out of the corner of my eye", which is really convenient when you're trying to get things done quick and not have to read a dozen bottle labels to get the one you want. I love these bottles I love the fact that they come pre-labeled it’s really annoying having to stick on labels on blank bottles these are so much better . This 32 oz bottle made for the Sani 512 food surface sanitizer is a really nice quality bottle. It has measurements on the side in both ounces and milliliters so that you can get the proper measurement of water to sanitizer. It is a nice bottle for the price. I like that the bottle is clearly labeled so there are no mix-ups with different products in different bottles. Home made labels smear or fade over time, but having the printing directly on the bottle is more durable. This spray bottle is specific for Food Surface Sanitizer solutions. A must have to distinguish each different chemicals Bottles. And this bottle is super strong and sturdy. We rate it 4 Stars! Food handling and controlling cross contamination is vital to a safe environment! Noble branded bottles comes pre colored coded and labeled! Each bottle is specific with task to avoid mix ups! Noble has 6 bottles with different description! We highly recommend these bottles for safety reasons! 4 stars! This was my first time ordering the thirty-two ounce labeled bottle for Noble Chemical Food Surface Sanitizer and I have been very satisfied with this purchase. I also ordered the spray triggers, which fit perfectly on this bottle. I would like to see additional sizes of this bottle offered in the future. I bought these to easily identify what liquid is in the bottles and have them look better than walmart bottles. I LOVE these bottles, they are nice and thick and sturdy. This is bottle only, sprayer is separate! This bottle works as expected. Ordered because we needed our cleaning products labeled per our state health inspector (SD). He said the labelling is sufficient to his standards. This bottle is a great addition to your cleaning supplies. No labels needed it looks very professional and clean. Provides directions and ingredients. I would highly recommend! This bottle works exactly as expected. Fits a standard sized spray top. Like how it's clearly labeled so I can easily tell my cleaners apart from one another. This 32oz. Labeled Bottle for Noble Chemical Sani-512 Food Surface Sanitizer works great. Heavy plastic bottle will last for years! Spray Trigger IMP 7029 works great in combination with this bottle. Very nice bottle here with this product. It comes nicely printed on the side in red lettering as to not confuse which bottle is which! This bottle was exactly what I needed to store sanitizer! I didnt have to label the bottle because its already clearly stated what is in it. Great size, and clean looking. Nice bottle that has many uses, safe plastics for sanitizer and many other applications, windex, vinegar, salt water, soap. to many to list all together. Convenient, inexpensive plastic bottle that's easy to identify. Holds plenty of sanitizer and very durable. The spray trigger (IMP 7029) fits nicely with these bottles. Great bottle to use for Sanitizer. Easily refillable. The bright red letters makes it easier for me to pick out among other cleaners. Cheap and durable. Got this to hold my bleach mix and it is a good thick plastic. I also got the Noble Chemical 10" Foaming Spray Trigger (IMP 7029) sprayer and its fits great with this. These specifically labeled bottles are great to identify the cleaning solution in the bottle. That comes in handy for quick clean up. I like the idea of saving time not guessing what is in the bottle. Nice bottle for simple storage of sanitizer. We loved how they are labeled already so you know which bottle is which. Effective way to have sani always on your station. I have been using this bottle for a while. It has been working well and never had leaks. The price is very reasonable. Good product. This spray bottle is made from a pretty thick plastic which I like. I also like how clearly it is labeled for the Sanitizer that will go in it, making it hard to grab the wrong bottle. you do have to purchase the spray part separately though. No more wasting plastic with these reusable bottles. Great price and great quality that you know will last. Just be sure to only putt the Food service sanitizer in here to make sure everything is safe to use for what it's intended for. I love this spray bottle because it is pre-labeled and that makes it easier for my staff to know what is it and what to fill it with. It doesn't get any easier than this to meet the labeling requirement for chemicals. Even more important, the durable label stays easy to read for a very long time and prevents employees from using the wrong chemical in the wrong place. This 32 ounce plastic bottle is meant for filling up with food grade sanitizer. We use this sanitizer to spray on our plates before we wipe them clean. We use these bottles extensively in the kitchen, as sanitizing is a big focus. The bottle makes keeping things properly labeled a breeze and prevents cross contamination. At our company we use this product to clean the toilets in our restrooms. We are a small business with a few employees so it is essential to keep our bathrooms clean. Nice bottle and easy to use. I simply filled the bottle with water, poured in my solution, shook bottle, and its ready to use. Fast shipment. Glad I purchased. I have nothing bad to say about this. The bottle is nice and sturdy, well labeled. Doesn't seem like the print will come off any time soon. I wish for a little bit more that the nozzle would be included with the bottle, however, it's understandable. Great bottles for many different uses and cleaners, can't complain. These spray bottles are great. Labeling on the outside already with their use, so there is no confusion as to what your are picking up. I like the coloring to distinguish the use and is perfect for my sanitation purpose. Would be great if it comes together with the spray head as one piece instead of ordering 2 items. These bottles are great! They are already labeled so there is no question as to what is in the bottle. All of my employees know what is there. These bottles are great work awesome for cleaning tables out in the dining room. They are nice in that the title is printed on the bottle and there is no sticker that can fall off or become unreadable. Great product, will continue to purchase!!!! Red like the bucket. I try to make it as easy as possible for the kids and this allows me that extra step to make sure they are using only appropriate solutions when needed. I thought these were a great deal but they didn't come with the spray nozzle which I guess I should have read more closely as I thought it was a complete package. Great product! Made of sturdy plastic that will hold up to any chemicals. Label allows for marking of exactly what you have in the bottle. these bottles are great because they are already labeled. the inspector doesn't even have to ask "what's in the bottle". they are really cheap here on this site too. This bottle is a must-have in any restaurant environment. It is clearly marked as sanitizer so no one can mistake it for another cleaner. Bright red letters make it easy to read too.